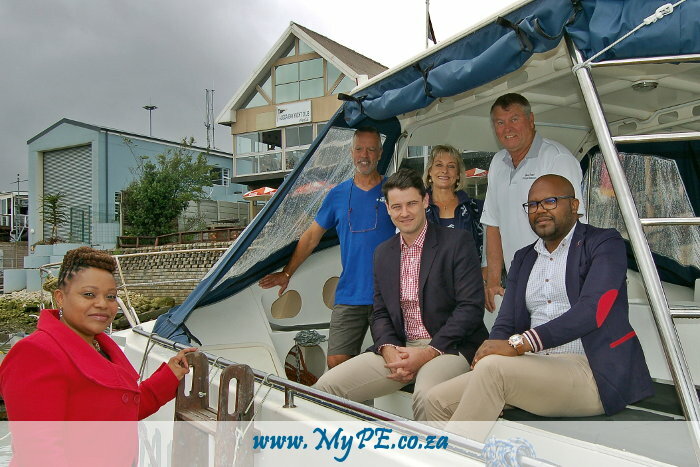 Algoa Bay Yacht Club: On Monday, 14 November 2016, Nelson Mandela Bay Municipality together with Nelson Mandela Bay Tourism enthusiastically supported the launch of a new venture for locals and tourists to experience in the city that creates enhanced accessibility to the marine tourism offerings. Stampede Cruises and the Blue Pearl – based in the heart of the PE Waterfront – will offer unique excursions that include, waterfront cruises, Island cruises and more. “We warmly welcome the addition of new products to the tourism offerings of the city. Through increased unique experiences in the destination the tourism sector can positively contribute to the economic, socio-cultural and environmental growth of our destination.” confirmed MMC of Economic Development, Tourism and Agriculture, Councillor Andrew Whitfield. Algoa Bay is an incredibly diverse Bay with four estuaries which need protection, the largest coastal dune field in the Southern Hemisphere, many historical shipwrecks, beautiful and safe beaches, some of the most diverse and colourful coral a diver could find as well as a variety of marine mammals and birds. Nelson Mandela Bay has recently also laid claim as the Bottlenose Dolphin Capital of the World. Stampede offers relaxed comfort on board a spacious catamaran, either seated on the sheltered bridgedeck saloon or upfront on the trampoline. Tours will offer an adventurous day out with either a leisure style or responsible conservation style tour where you have the opportunity to visit St Croix, Jaheel and Brenton Island, or further afield to the Bird Island Group. The Blue Pearl offers adventure trips for up to 8 passengers around Algoa Bay and this creates awareness for Marine Conservation while affording passengers the opportunity to enjoy the beautiful Bay from a unique perspective. The cruise assists to cultivate public support for the Algoa Bay Hope Spot and to promote the ethics and principles thereof. The Blue Pearl is an 8 meter RIB with 2 x 115 horse power motors. Blue Pearl can easily reach cruising speeds of 25 to 30 knots. Blue Pearl follows the ethos of “Take 3 ForThe Sea” – take3.org.au which promotes public participation in beach cleanliness and encourages conscious enjoyment by all ocean users. NMBT CEO, Ms Mandlakazi Skefile, “We are excited to collaborate with both products in order to showcase the destinations unique experiences and natural heritage. The additional experience will attract new visitors and extend the stay and spend leading to greater spend and thriving industry. Mandlakazi Skefile, Rod Lochhead, Andrew Whitfield, Cheri Lochhead, Morven Maclean and Anele Qaba.